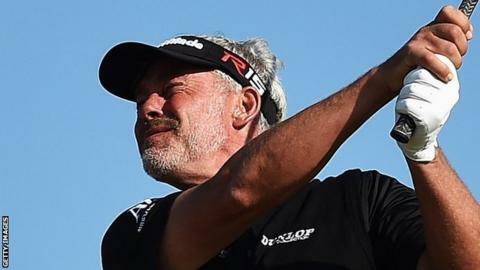 Darren Clarke lies seven shots off the lead after firing a first round of two-under-par 70 the Italian Open at the Golf Club Milano in Monza. The European Ryder Cup captain carded an eagle, four birdies and four bogeys in his opening 18 holes. Belgian Nicolas Colsaerts leads on nine under, two ahead of Francesco Molinari, Shiv Kapur and Kristoffer Broberg. Paul McGinley is four under, with Padraig Harrington joining Clarke on two under after their first rounds. Damien McGrane is level par, while his fellow Irish competitors Kevin Phelan, Simon Thornton and Gavin Moynihan are all one shot worse off. Moynihan, one of Ireland's victorious Walker Cup contingent at Royal Lytham & St Annes last week, is making his debut in the professional ranks.